oslo, the time when horse sleds and wagons were slowly replaced by automobiles. people crossed the street at will, horses stopped if needed, most of the times, but cars. at some point the need for traffic control arose, crossings were defined, first zebracrossings with traffic lights were set up. But somehow pedestrians accidents did not reduce as expected. After closer inspection it turned out norwegian women did not care of the light. Questioned they replied that there were only mens pictured on the lights, so they could not be meant. 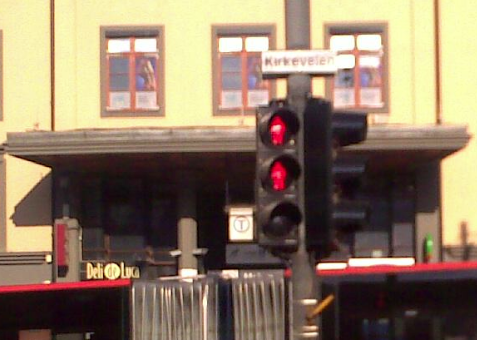 New lights with two red ones were set up, norwegians are rather dry, so they figured women already crossed the street irrespective of the light, so no one would stop because the green one did not show the correct pictogram. Although long discussions took place if women or men should be top, outcome of these is lost in history (any pointers of more knowledgeables appreciated). But at the same time womens liberation started to gain momentum and women began to wear trousers and these would not stop for a light showing a skirted figure, what business should they have with scotsmen. Surprisingly accident numbers declined. Evolution took place, cars began to brake, no sane automobile would collide with norwegian feminists if avoidable. Due to expense cuttings the red light with the skirted figure, scott or not, were slowly replaced by the nominal men bulbs, so there are two red and one green.